Nearly 7 million suffer from it. T.J. Holmes with the story. One man found new hope after losing nearly all the hair on his body. Hey, T.J. Look, all this beautiful hair. Some time went into this hair this morning. Even the men with your beards, you put time into your hair. It's a part of your identity and confidence. Now, imagine losing all of it. What that would do to it. This man lost every hair pretty much from head to toe but when I met him had so much hair he just had gotten a haircut. Over the course of six months in 2015 dad and attorney Jason Lipkin lost all the hair on his body. Everywhere I went every time you saw a person that you knew they turned white as a ghost. Most people assumed I had cancer. Reporter: But he wasn't going through chemotherapy. He was diagnosed with alopecia, an autoimmune disease that causes hair to fall out. Every single hair on my body gone. Reporter: Here is Jason today. What's it like to have hair again. The smile says it all. It's amazing. I get to feel -- I feel like myself again. Reporter: His journey started back in 2015. At first it was just a spot on his beard but later hair came out in clumps. I'll never forget it. He was showering one day and I can hear him screaming from the shower because the hair started to fall out into his hands. Reporter: His hair, eyebrow, eyelashes, all fell out. There were times when I would be in court arguing a motion on the record and like a judge would stop me and out of concern and like it would get addressed. Reporter: Jason was diagnosed with a severe form of alopecia for which there are few long-term treatments that work. How did you see your husband change? He just was withdrawn. He was -- he felt hopeless. He wasn't dying of cancer and this wasn't, you know, something that was going to kill him but emotionally the emotional toll was -- it was just a lot to take. This is unbelievable. Reporter: But through dermatologist Dr. Emma Gutman, Jason got a rare opportunity that changed his life. A chance to participate in a clinical trial. I've seen devastating cases of appearance in children, it affects their entire life, their performance at school, interaction with friends. Reporter: He joined the small early stage trial at mt. Sinai hospital in New York in 2017 where doctors were testing a promising medication called a jak inhibitor. Patients growing hair is unbelievable. Reporter: It helped several participants regrow hair. Tart taking these two pills and over time what happens. It grows. My hair is growing. Reporter: Now uncertainty. Today Jason takes his last pills from that clinical trial. We have been told that the likelihood is that he's going to lose it all again. At some point. They don't know how long it will hold on. Reporter: For now the couple is living in the moment. Staying positive and keeping that hope. Would you have preferred to have not gone through the experience of having the hair you have now if it's just going to fall out and have to go through it all over again? This time at least I know it's not going to be some doctor saying, no, there's no hope. At least I know there's something out there. But that might be a long way off. Still early in trials and several more to go through before it would be available to the public and we did get an update from him, that was two months ago, he says he is starting to get light thinning of the hair in some places so he might have to go through this whole process of losing his hair again. But some hope out there down the road. 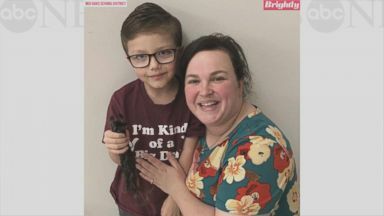 Daniel Williams, 6, grew his hair out for two years so children who are experiencing hair loss due to cancer, alopecia and other disorders can have a wig. 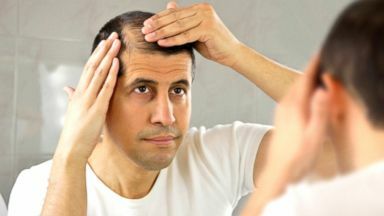 British researchers claim that a drug used to treat osteoporosis could also help stop hair loss.